Options to re-purpose CAD models into XVL that can be used by technical illustrators. Concurrent workflows–the XVL model remains linked to the native CAD so that illustrators can easily update their work when the design is updated. Automation features in XVL Studio that create advanced illustrations such as exploded views with automatic trace line creation (bill of materials, notes, labels), which can then be enhanced. Templates that can be used to speed manual processes or that can be embedded as automatic operations with PLM/PDM systems. All types of technical illustrations: conventional line, exploded view, and cutaways are available. 2D documents that may be exported in all the popular vector and raster formats. 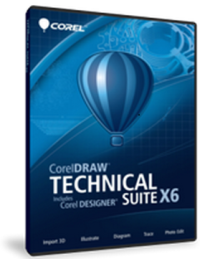 CorelDRAW Technical Suite X6 integration for the most advanced graphic editing functionality when needed.